Today is the launch of the Fat Quarter Shop Lady of Lake Quilt Along! The pattern is a part of the Classic and Vintage quilt series. This quilt pattern is ideal if you want a quick finish featuring classic blocks, as each block finishes at 12 1/2 inches. And if like me you tend to makes smaller quilts you’ll be happy to know the pattern even comes in Lap size (as well as all the way up to a King size). For my first block I have used a combination of Tasha Noel Pixie Noel prints and Kona solids from my stash. Fat Quarter shop are giving the opportunity to try before you buy as you can download the block pattern for free from their website here. Then if you want, for only a few dollars more you can purchase the downloadable quilt pattern directly from the Fat Quarter shop. If you haven’t participated in a quilt along before I highly recommend it! You essentially follow a schedule of when to complete your blocks and you can choose to post your pictures on social media so the Fat Quarter Shop and other participants can see all your wonderful work (the Instagram hashtags are #ladyofthelakequilt and #fqsquiltalong. I find quilt alongs help me stay motivated to finish a project and whether you follow along via Instagram or Facebook you’ll love seeing how different all the blocks can look depending on the fabric that is used. If you want even more information and/or see exactly how the block is pieced together pop over to the Fat Quarter Shop You Tube Channel! 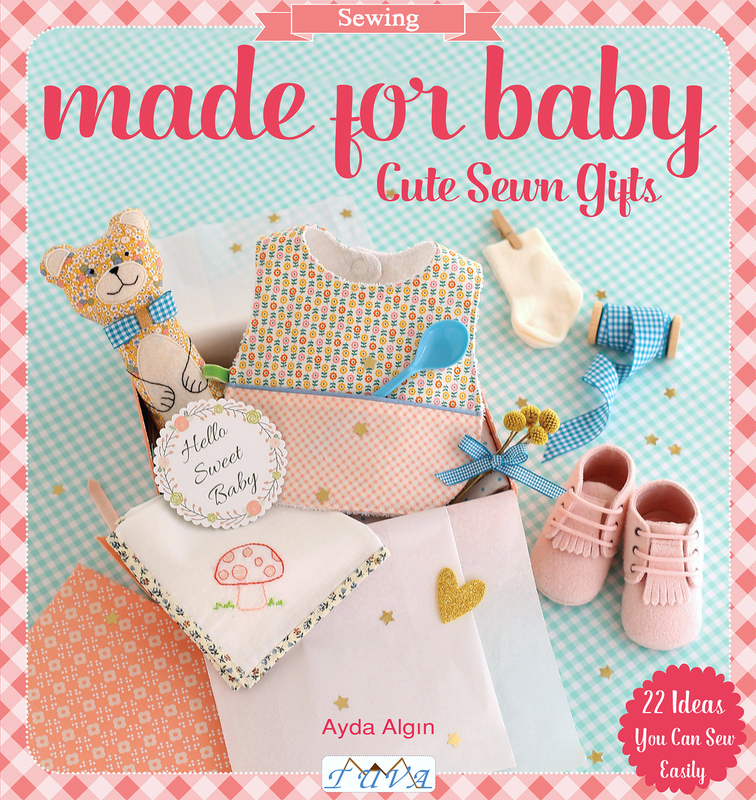 Ayda Algin recently sent me a copy of her brilliant new book Made for Baby, Cute Sewn Gifts which she has published with Tuva Publishing. For a long time I have been a huge fan of the projects that Ayda features on her Instagram account and blog so I was so excited when she mentioned she was releasing her first book! 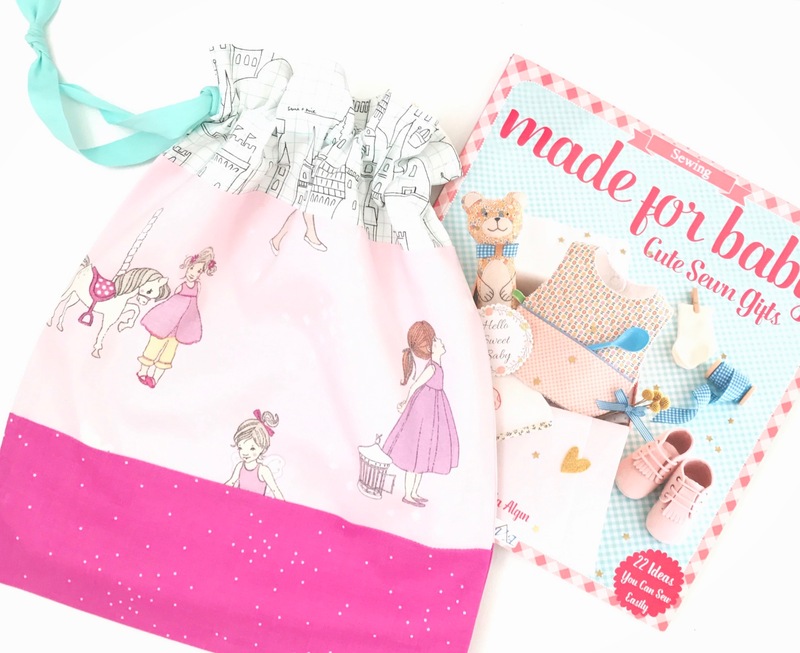 Ayda’s book features 22 projects from pouches in all shapes and sizes, an adorable wall organiser to gorgeous appliqued quilts. And while the book is designed for those wanting to make baby gifts, so many of the projects work for all ages and stages. In fact one of the first items I made was a pretty drawstring bag I made as a birthday gift for a little girl. One of the first things I noticed about the book is the strong influence Ayda’s background as an engineer has had on the way she has prepared the patterns. Each project is paired with an intricate amount of measurement details, which means that even if you have never sewn fabric boxes or a stuffed toy you will feel very confident cutting your pieces (and if you need any extra assistance the first chapter also features instructions on how to do a range of sewing techniques). I also really appreciated the way each project is photographed from a variety of angles, Ayda’s styling is beautiful and the gorgeous photos also mean you can see all the details and exactly how the project will turn out. I was so inspired by Ayda’s book with Tuva I actually made a range of projects for the blog tour! bib project. 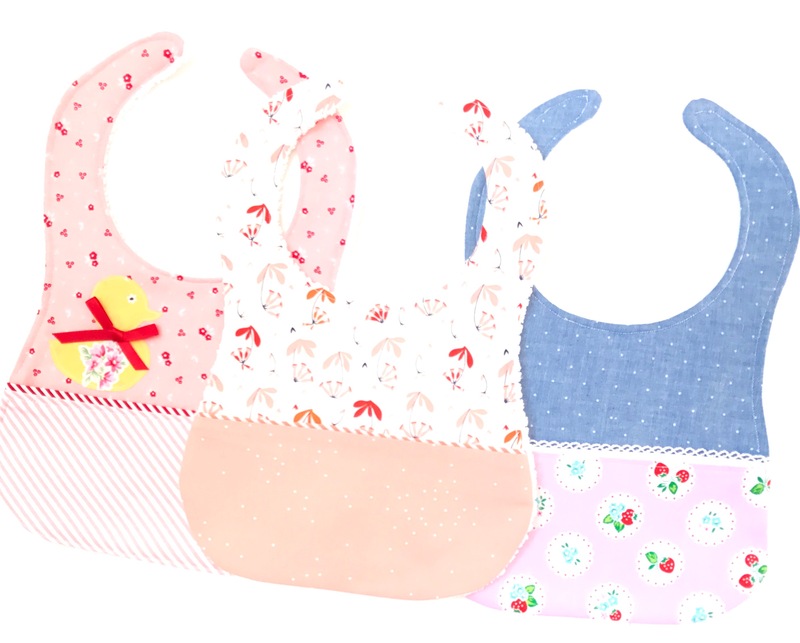 I was so inspired by Ayda’s bib project I made three bbs using some of my favourite fabrics (because I wanted the bibs to be as cute as the baby outfits its covering). It was the first time I added an applique to a project. But thanks to Ayda’s fantastic instructions I had no problems and am definitely going to add more appliques to my projects in the future! Finally I made the super quick and sweet little star teething toy with a few pretty scraps and a cute ribbon tag. In the book Ayda used a wooden teething hoop (ideal for a teething baby) however I was unable to find any locally so instead I used a specially designed plastic teething ring which you can also use to hoop on to the pram or crib. Made for Baby, Cute Sewn Gifts is as versatile as it is inspiring and sweet. It’s the kind of book you will always have on your sewing table because of the range of projects and inspiration. The book is available to buy right now or you could also pop over to Ayda’s blog site and enter to win a copy plus a few crafty extras! Tomorrow Lauren from Molly and Mama will be creating another project from Ayda’s book and I can’t wait to see what she makes! You’ll be able to see it on Lauren’s pretty blog (and while you are there definitely have a look some of the things Lauren has made in the past – you won’t be disappointed). Welcome to my turn on the Happy Flower Quilts blog hop! Happy Flower Quilts was originally written in Japanese by Atsuko Matsuyama over 5 years ago, and like many people I owned a copy of the original book. Of course I couldn’t understand the instructions however the photos and projects are so beautiful they provided me with lots of inspiration. You can imagine my delight when Zakka Workshop contact me to say they were releasing an english version of the book AND would I like to join the blog hop! The book has stayed true to its original release – it still features over 30 projects and contains such beautiful colourful photos, however I can now actually create the projects from the book just as Atsuko intended thanks to the english instructions! The first project I made from the book was a super cute patchwork placemat for my 6 month old great niece for her first Christmas. I paired it with a feeding set, so when she started learning to eat it would be in cute patchwork style. Like most projects in the book it is all about the sweet details, and although I didn’t add lace I did added a hand stitched hexie in one of my favourite Atsuko Matsuyama strawberry prints. For the blog hop I decided to make to make the lunch tote, however instead of filling it with snacks I’m going to fill it with sewing supplies! Lecien Fabrics were gracious enough to supply me with their gorgeous Antique Flower in Pastel collection along with their sweet and soon to be released strawberry handles. Seriously have you ever seen prettier handles, can’t you just imagine them being featured on makes for family, for friends, for yourself! The tote turned out slightly smaller than I originally thought however it is perfectly sized to carry all my sewing essentials. I paired the tote with the patchwork scissor caddy from the book. I used a combination of machine and hand stitching and made my own bias binding (making sure I cut it on the bias so it sat nicely on the curves). 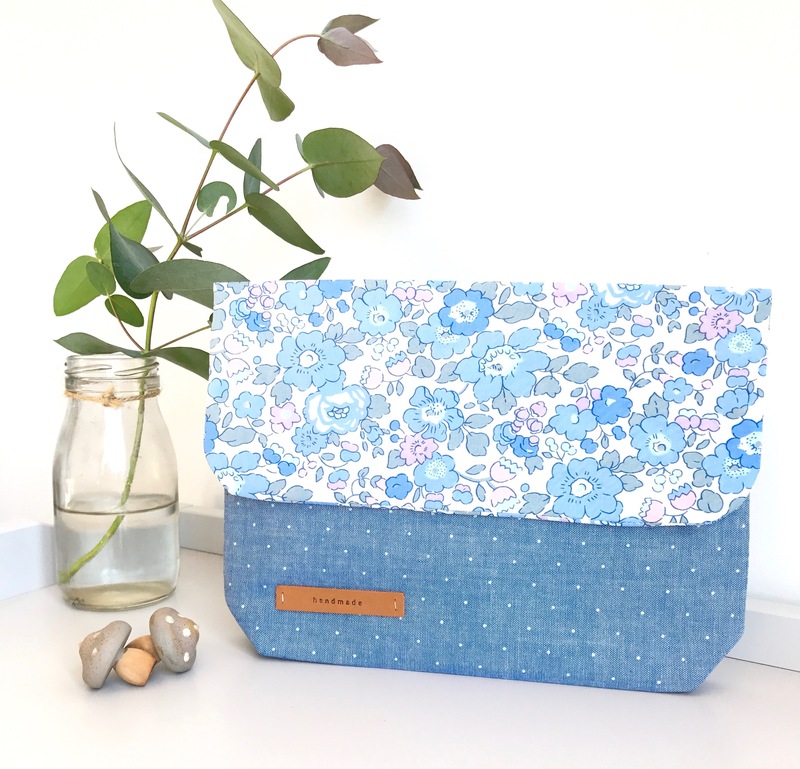 The caddy is ideal if like me you take your sewing on errands with you as it keeps your scissors safe and protected whilst in a pretty little package. The sewing tote is going to be perfect when I join along the Happy Flower Quilt Along (QAL) that commences on March 6. Keeping all my sewing supplies together along with the tiny pieces for the embroidery blocks. For further details about the QAL have a look at Kristyne from the Pretty By Hand website. Kristyne, aong with Melissa from Oh How Sweet Co, Wynn from Zakkaart and Zakka Workshop have got lots of super fun planned for the QAL. And don’t forget to continue following along with the Happy Flower Quilts blog hop (details below)! There are so many talented makers who will be making items featured in the book and quite a few that have already been featured.